Allie Hagan is the author of “Suri’s Burn Book,” one of the best, most hilarious, and most on point celebrity sites on the internet. Until recently, she had a day job in D.C. and a life that isn’t occupying the sensibilities of a Tom Cruise’s spawn (follow her on Twitter here). Let’s start at the beginning. How did the idea to start the blog first arise, and how did you put it into action? What was your “start-up” labor, for lack of a better phrase? I would make jokes on my own Twitter account every once in a while about celebrity children — what Shiloh was wearing, what Suri was up to — and a friend suggested I make a Tumblr with those kinds of jokes. I thought that was a good idea, but I knew that if I wrote it as myself, it would come across as extremely mean and possibly kind of creepy. So I noodled on it for a few days and came up with the angle — it’s written from Suri Cruise’s perspective, and it’s called Suri’s Burn Book. The start-up labor was really easy, just because Tumblr’s interface is so simple to use. I posted a few posts, sent a link on Twitter and Facebook, and that was that. When did the blog first go viral, and how did that change the way you handled it? It’s weird, because I actually wouldn’t say that the blog ever went viral. After about a week, maybe, it was written up on somebody else’s blog as something to check out, and after a month it was Time Magazine’s “Tumblr of the Week.” But I don’t think it was ever, like, The Thing, in the way other memes have been. It never blew up like Binders Full of Women or Feminist Taylor Swift — Suri’s climb to 150,000 Tumblr followers took two years. How did you decide what Suri’s “voice” sounded like? Did it just come naturally, or did you refine it over time? It does just come naturally, although it has changed over time. (Maybe with Suri’s maturity from 5 to 7.) When I first started, I imagined her as very bitter, hardened, war-weary from a life with Tom and Katie. Her insecurities came out over time — the royal baby, Blue Ivy Carter, basically anything that’s a threat to her relevance. Academic proposition: Suri’s Burn Book is actually a satire of a certain type of privilege. Thoughts? Absolutely. The pop culture obsession with celebrity children is a very new phenomenon. The example I like to give is that Michael J. Fox was one of the biggest celebrities in America in the ’90s, and he has four kids. I don’t even know their names, and this is my (cough) area of expertise. People didn’t care that much. But then the Internet came, People and Us got websites, and TMZ came into existence, and there was suddenly a 24-hour news cycle for celebrity news. There are only so many movie stars, so they needed someone to write about, and the natural extension of that was celebrity children. And coincidentally, that happened right as five major celebrity families started having kids — Violet Affleck, Kingston Rossdale, Shiloh Jolie-Pitt, Suri Cruise, and Sean Preston Federline were all born within eight months of each other. Around that time, Brooke Shields spoke openly about her postpartum depression, Anna Nicole Smith’s daughter was the subject of a paternity scandal, and Madonna was in the middle of her Malawi custody battle. So celebrities got wise to this idea that they can raise their profile (and their bank accounts) by parading their baby around town. In my opinion, most celebrities had/have babies for the “right reasons,” but the attention is a nice byproduct. You’ll never convince me that the MULTIPLE MILLIONS of dollars the Jolie-Pitts made selling photos of their children was a selfless act of charity. And then it’s kind of a vicious circle. Do you think that baby mohawk was Kingston Rossdale’s idea? Or that Penelope Disick’s headscarves aren’t a calculated choice to get people talking about Penelope Disick’s headscarves? Suri’s Burn Book (I hope) points out the ridiculousness of (A) celebrities dressing their toddlers in $200 shoes and (B) us knowing that Suri Cruise wears $200 shoes. Because it’s all part of this bizarre industry of crafting and selling children’s personalities. Still, you can’t have it both ways. When I worked, I would blog at night when I got home — like an escape, almost. Now, Suri is my full-time job, so I do it in the morning and then have the rest of the day to work on other projects. This has been the craziest year of my life, and the craziest kind of privilege. I work with a company who handles the back end of the blog and the ad sales, so all I have to do is post every day. I’m trying to figure out what I want to do next, and I’m very, very lucky that I have had the time to do that and try to break into something else. I’ve just been trying to write as much as possible to see if I’m good at any other kinds of writing. I sold a pilot to VH-1 that was shot but didn’t get picked up to series. I’m hoping to get on a writing staff this spring, but everything is obviously very competitive here. How do you manage the social media / publicity component of the blog? When does it feel like work, and when does it feel like fun? I wish I did more, really. I feel like I don’t use the Twitter account enough, or that I’m missing good ideas for publicity. But the blog is doing just fine without it, so I don’t worry too much. 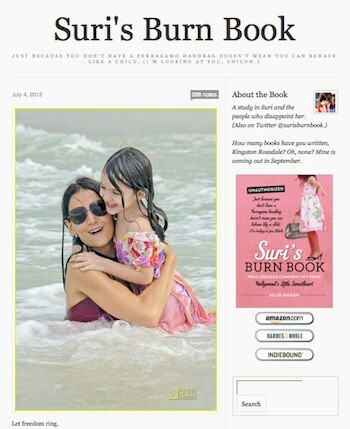 I made a Suri’s Burn Book Facebook page for like a minute, but I hated it — I’ll never do that again. How do you deal with the assumption that your blog is easy or silly? I mean, it is seriously funny, but that doesn’t mean that it’s a trifle. It doesn’t bother me at all if people take the blog seriously or not. If people get on there and think, “This girl totally gets me! I’ve been saying Violet Affleck is plain and boring for YEARS,” then they’ve totally missed the point but at least they’re getting something out of it. A lot of work goes into it, and a lot of my heart at this point, but it’s still just comedy. Apart from monetary compensation, what makes all the internetting and behind-the-scenes labor worthwhile? Why, in other words, do you do what you do? I love when I see tweets from people saying that it brightens their day. Knowing that it still makes strangers laugh, especially on like a boring Friday afternoon at the office, is just the best. It definitely feels like my job at this point; it’s an obligation. But what a great job: just trying to make stuff that people want to talk and tweet to their friends about.